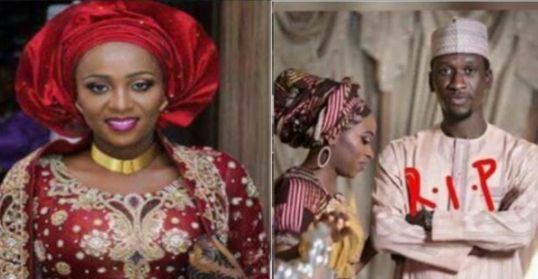 Nigeria police have filed criminal charges against Maryam Sanda who allegedly stabbed her husband, Bilyamin Bello, to death last Saturday. Bilyamin, a real estate developer, was the son of a former PDP Chairman, Haliru Bello. The Federal Capital Territory police spokesman, Anjuguri Manzah, said in a statement on Wednesday in Abuja that the command had secured a remand order against Maryam for two weeks from the FCT High Court pending the completion of investigation. He added that this was done because the suspect had a six-month-old baby which made it difficult to remand her in prison custody. Manzah said the case had been assigned to FCT High Court No. 32 Jabi, Abuja for trial by the Chief Judge of FCT, adding that the suspect was charged with culpable homicide punishable under section 224 of the Penal Code. He said, “It should also be noted that this present charge is as a result of preliminary findings; at the end of investigations, additional findings will determine whether the current charge will be amended or whether other persons will be charged along with the suspect. Findings by our correspondent indicated that the security guards who were picked up by the police for interrogation in respect of Bilyamin’s death had been released. It was gathered that they narrated to investigators what they knew about the events leading to the death of the businessman. They were said to have agreed to serve as prosecution witnesses against Maryam after volunteering information on the alleged murder to police detectives. “The security guards were released after telling the police what they knew about the incident. They subsequently agreed to serve as prosecution witnesses, meaning that they would appear in court to give evidence on the matter,” a source explained.